Ten miles north of the town of Bandera, Texas, is historic Bandera Pass, a great gash in the Guadalupe Mountains, through which for centuries men have passed—Indian hunting parties, prospectors, conquistadors, missionaries, emigrants, stage coaches, United States troopers, ox and mule-drawn wagon trains, even camel caravans. Much colorful history clusters about silent, rugged, alluring old Bandera Pass; there are legends and traditions of Indian battles, tragedies, narrow escapes, and even tales of buried treasure hidden in ravines there to prevent it from falling into the hands of robbers. Here is the story. Account written by Mrs. George H. Shanholtzer of Round Rock who was one of the early teachers of the school. Here is good, early Travis county Texas history. Lengthy and in-depth account of establishment, early development, original settlers of the town of Castroville on the Medina River 25 miles west of San Antonio and of early hostile Indian depredations in the area. Related by J. K. P. Yeary. Account deals with the experiences of J. K. P. Yeary, long-time Collin county settler and resident who speaks of first-hand accounts of Indian fights and tragedies of his life. According to the official records in the War Department at Washington, 825,766 horses fought in the American Civil War under the Union flag. Vouchers show that these horses cost $125,864,915, or an average of $140. The Confederate records cannot be found, but it is estimated that there were proportionately as many horses under the Stars and Bars, thus leaving a million and a half horses in the fighting army. These old war horses have never been given their true recognition in history. There were many noble animals among them, with an intelligence and understanding of warfare that seemed at times almost human. Here is the story. Account of The wedding of Miss Sarah Pitts and Mr. Wilson Randle - the first wedding in San Marcos and an account of the tragedies that attended the event. Of the various Indian tribes that inhabited Texas in the early days, none were more fierce and warlike than the Apache. The Comanches, Kiowas, Lipans and Kickapoos were the more recent tribes to depredate as far south as San Antonio and Austin, but only occasionally did the Apaches make their raids down into this section, for their strongholds were in Arizona and New Mexico, and they had to travel a long way to make raids into South Texas. 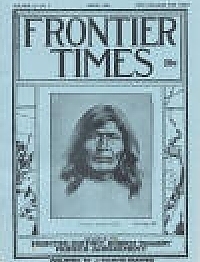 Here is the account of the feared of all Native American tribes. Was The Bowie Mine Found? On October 15, 1896, there appeared in the St. Louis Globe Democrat an article written by James Bee, telling about the finding of a mine in Menard county, Texas, by a man named Frank Hobson. This account is Mr. Bee's article as it appeared in the Globe Democrat. CAPT. J. B. DUNN DEAD. Account of the death of Captain James B. Dunn at Dallas, March 1st, 1944. A native of Navarro county, Dunn was reared by his grandparents in Washington county and lived there until his early thirties when he moved to Brown county to enter stock farming. He was active in that work until 80 years old when he retired and moved to Dallas.